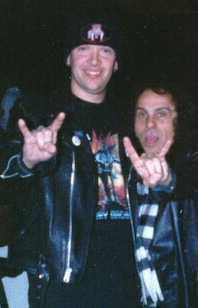 Jim Rhoads and Ronnie James Dio. Geddy Lee of Rush - Vintage 60's Vox bass parts and plexiglass Rickenbacker finger rest for his 4005 bass. Chad Taylor of Live - New Vox AC/30, 2 - 60's Thomas Organ Vox tube amps. Lenny Kravitz - 1963 Vox AC/30 non top boost. Bryan Adams - Vintage Shure microphone. Greg Strzempka of Raging Slab - 1981 Rickenbacker 460 in Burgundyglo. Dee Dee Ramone - 60's Vox Phantom VI guitar. Doug Fieger of The Knack - New Vox Python guitar strap. Danny Peyronel of UFO - Vox organ repairs. The Edge of U2 - 60's Vox Starstream VI guitar. Philip Kubicki of Kubicki Basses - An original Kubicki mini flying V guitar. The Cast Of Beatlemania - Reissue Rickenbacker 360/12V64 and Pyramid strings. Michael Wright of Vintage Guitar Magazine - Original Lee Stiles guitar among many others. Kimiko Yamamura of The El Caminos, Japan - Vox organ. John Wackerman - North Drums. Steve Ferrone - drummer for Tom Petty. People we have talked to or have visited the shop over the years.